Guests sometimes ask if we can recommend somewhere to get a suitable outfit or a period hairdo for Candlelight Club parties. So we've put together a list places you might want to try—and if you have a recommendation yourself please email us and we'll add it. Fashion brand whose vintage-conscious aesthetic includes a line of 1920s-inspired flapper dresses. The garments are designed in-house then hand-stitched and beaded in India. You can buy online from the Frock and Frill website, but there are also bricks-and-mortar stockists. They are offering Candlelight Club customers a 25% discount if you buy through their website: just use the code CANDLE25. Online purveyor of a unique selection of original vintage and vintage-inspired dresses and accessories, giving you the opportunity to own classic, quality, one-off vintage pieces or invest in a contemporary design that embodies that vintage style. They cover a range of vintage eras but you can see some of their 1920s schmutter here. Candlelight Club customers get a 20% discount by entering the code JAZZY20. A West End tailor with a family tradition stretching back 200 years. Their shop in Carnaby Street sells a range of silk accessories such as bow ties and scarves, socks and shirts with exotic cuffs and collars, but they also offer made-to-measure and fully bespoke suits and coats, with a house style that betrays their origins as military tailors. They make ties for clubs (including one club that only has four members) and military regiments and even make ties for Savile Row tailors Huntsman. Drop in to the store to pick up your Candlelight Club discount card offering a 15% discount on all purchases. Now offering a bigger than ever range of 1920s reproduction dresses in sizes 8–18. (It's worth visiting the shop as there is more choice in store than online), plus reproduction 1920s shoes, scarves, pearls, fascinators, jewels and much more. Candlelight Club guests will get a 10% discount on selected 1920s dresses upon production of a valid ticket when shopping in store. Formerly located just off London's Carnaby Street, Atelier are now based within Revival Retro (see above). They offer fine hats, fascinators and hat-making supplies for ladies, as well as a limited range of trilbies for gents. They also run hat making courses. They are offering 10% off all supplies (new and vintage) and full-price ready-to-wear hats to Candlelight Club customers when you mutter the password "Casablanca". This Aladdin's Cave is crammed with original ladies' fashions from the 1920s to the 1980s, plus costume jewellery, hats, bags, lingerie and shoes, and menswear from the 1940s on, including a good range of ties and cravats. They are offering a 10% discount upon production of any valid Candlelight Club ticket. Vintage clothing, accessories and homewares, based in Greenwich Market and rated by Homes and Antiques among the top 50 vintage shops in the country. They are offering a 10% discount upon production of any valid Candlelight Club ticket. They don't have a website, just a Facebook page, so this is really one to visit in person. 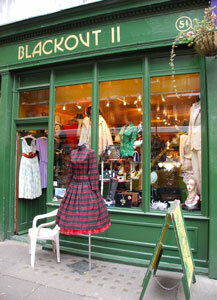 Lots of vintage ladies' clothes and accessories, plus suits, jackets, dressing gowns, hats, etc. for gents, and an intriguing range of magazines, homewares, sunglasses and more. They are offering a 10% discount upon production of any valid Candlelight Club ticket. They've been going since 1993 but their Facebook page is saying they will close for good at the end of January 2018—not sure if they will carry on as an online concern after that. At the junction of Cheshire Street and Brick Lane, this shop spans a wide period from 1920s to 1980s. They are offering a 10% discount to customers who mutter "Candlelight Club" when making a purchase. Selling clothes, shoes and accessories from the 1900s to the 1980s, this establishment also boasts on on-site alterations team, café, cocktail bar and arts/music space where they often have evening events—drawing classes, jive classes, live music, open mic, fashion shows, book launches, club nights, comedy nights and more. Mention that you're looking for something to wear to a Candlelight Club party and they'll give you 10% discount. Note that they are no longer at their original Curtain Road address. Located between Angel and King's Cross, Pennies Vintage has one of the largest collections of original 1920s flapper dresses in the country, as well as a wide selection of pre-1950s fashion and accessories. Mention that you're a Candlelight Club guest and you will get a 10% discount. Run by the son of Penny from Pennies Vintage above, Oliver Vintage specialises in vintage and antique clothing from the Victorian era through the 1950s, as well as select designer and haute couture pieces from throughout the 20th century. Their range includes a large selection of original 1920s beaded dresses, ravishing embroidered kimonos from the 1920s and the 1930s, piano shawls encrusted with embroidery and antique lace wedding dresses. Mention that you're a Candlelight Club guest and you will get a 10% discount. A vintage-inspired reproduction clothing brand, offering 1920s–1940s styles with an eye also to clothing suitable for swing dancing. Formerly La Vie en Swing, operating from an atelier in Barcelona, they offer a worldwide mail order service. Candlelight Club customers get a 10% discount by entering the code "candle10" when ordering. Offering an extensive range of reproduction dresses, tops, skirts and headbands, though admittedly with the focus on the 1950s, rockabilly and a bit of 1940s swing, rather than Prohibition era. To get a 10% discount use the discount code "candlelight". Online store selling vintage costume and designer jewellery, as well as vintage-style gemstone jewellery including necklaces, pendants, bracelets and earrings. (They also have the odd tie pin or pair of cufflinks for gents.) They are offering Candlelight Club customers an exclusive discount of 10% on all products—just use the code CANDLE10 when ordering. Online retailer selling vintage-inspired dresses and accessories, primarily 1920s and 1950s styles. They have a broad range of flapper dresses, shoes, bags, capelets and accessory packs, affordably priced, and offer free worldwide shipping. (They give a US phone number but the goods are evidently dispatched from China.) Use the code AFS5 when checking out to get a 5% discount. A website designed to help women find their perfect outfit for a special occasion, including a blog with style guides, event guides, etc. Their bestselling brand is Gatsbylady, offering affordable flapper dresses, perfect for a night at the Candlelight Club. Zalando.co.uk is the UK's largest online wardrobe, offering over 1,500 brands—many not available anywhere else in the UK—including vintage-inspired cocktail dresses and accessories, plus men’s waistcoats, jackets and bow-ties (along with a huge range of distinctly non-vintage apparel too). Free shipping and returns. Original 1920s dresses are hard to find, and I've never seen quite so many together in one place as you will find at Tin Tin. Mind you, they don't come cheap… This place has a lot of stock crammed into a small space, but they now also have a separate vintage luggage department on the first floor. Just off Brick Lane, this emporium, unusually, focuses almost entirely on men's clothing, hats and shoes. Eclectic mix of general vintage with some interesting finds—including some rare 1920s clothing—though prices can be steep. No website and the Facebook page was only recently reanimated after a gap of five years, so perhaps best just to pop in. Website of a firm specialising in reproduction 1930s, 1940s and 1950s clobber including a limited range of menswear (though the clobber on display for men all seems to derive from the 1940s onwards). The owners are swing dancers, so the clothes are designed to be hard-wearing and easy to care for. 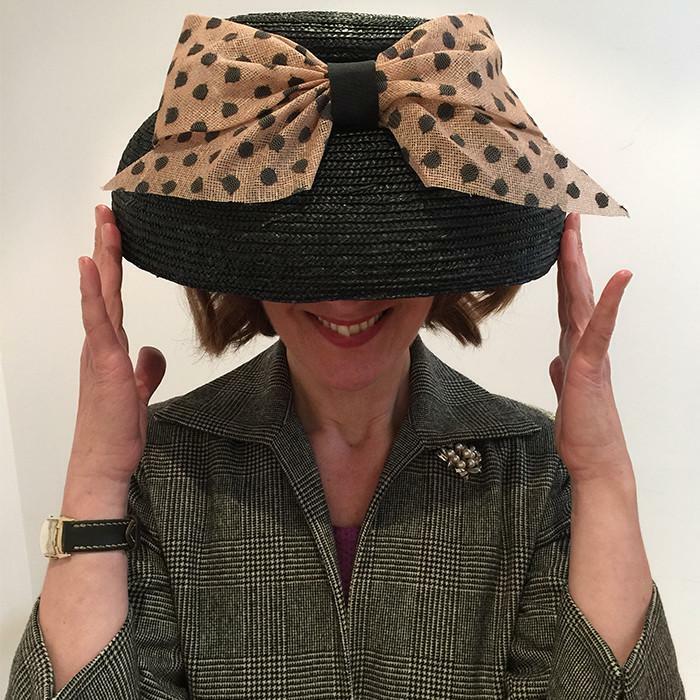 Online shop offering high-end vintage, vintage-inspired and designer costume jewellery, specialising in the 1920s to 1950s, run by Canterbury-based collector Natalie Leon. An online shop on Etsy selling 1920s-style headbands and fascinators—they have over 1000 styles to choose from. Even though they are based in San Francisco, postage to the UK is very reasonable. At 11 Boulevard Saint Martin, 75003 Paris, you can buy very cheap Jazz Age accessories—35 euros for a dress and feather headband; long black gloves and cigarette holders are both 9 euros a piece. They also have costume rentals. For more posh costumes and rentals (Louis XIVth themed balls) see Académie du Bal Costumé, 22 Avenue Ledru Rollin, 75012. Bespoke period outfits made by Welsh designer Barbara Green, to patterns created from original garments, including flapper dresses and evening gowns, with matching accessories, as well as boating blazers and Oxford bags for men. Both a physical shop (in Darwen, Lancashire) and thriving online emporium, this family-run business offers a wide range of women's vintage clothing, designer vintage, 50s clothing, indie clothing, vintage accessories, vintage costume jewellery, vintage collectables and vintage homeware. But we don't stop there. We also stock a wide a varied range of alternative clothing, brand new reproduction pieces including accessories, jewellery, retro clothing, fifties style and vintage style rockabilly dresses from names such as Hell Bunny, Collectif, Banned and more. A 1920s repro brand, offering flapper dresses, headbands and handbags. They offer an online shopping service with shipping to the UK. Stuck for an outfit to wear? Angels, the country's oldest and largest costume supplier, is offering Candlelight Club customers a 15% discount on rental and purchases at their prestigious Shaftesbury Avenue store. To claim your discount use the code CANDLE19. Buckinghamshire-based costume hire that comes heartily recommended by a Candlelight Club customer (pictured, in the outfit she hired). They have an online shop selling generic party costumes, but it looks as if you are better off visiting in person to get access to their best stuff. A vintage hair and make-up styling team who offer their services for parties, weddings, hen nights, photo shoots, and sometimes their own pop-up salons. They are currently offering Candlelight Club customers a 10% discount on their "Takeaway" visiting service. Mobile make-up artists and hair stylists specialising in vintage styles, offering make-overs for hen parties, proms, weddings, etc. Mention the Candlelight Club when booking to get a 10% discount plus complimentary false lashes! Founded in 2005 by Nina Butkovich-Budden, Nina's Hair Parlour was the country's first vintage hair and makeup salon and went on to acquire many film, TV, stage and celebrity plaudits. Nina has had bricks-and-mortar salons in The Cut and Alfie's Antiques Market, but following the launch of their Personal Premiere Service in 2012 the Parlour's service is now by appointment only. Vintage beauty stylists the Powder Puff Girls formerly had two "Powder Rooms" in London, one in Shoreditch and one off Carnaby Street (at the latter you could sip on a Bellini while you are pampered) but it looks as if their services are currently offered at your own premises only. The work has featured in the pages of Vogue, Elle and Harper's Bazaar. Vintage and contemporary styling in a Shoreditch salon (think shabby chic, taxidermy, books on tattoos, etc). Running workshops making fascinators or jewellery (or flower crowns) for your hen party, at London venues in Exmouth Market or Kentish Town, a range of other venues around the UK, or coming to your home. Mention that you are a Candlelight Club customer and you will receive a 10% discount on their premium package.